deVine Wines is very excited to host a tasting and fundraiser on Thursday, December 10, 2009. The tasting will take place between 4:00 PM and 8:00 PM. Tickets are $20.00 each and can be purchased on-line or at the door. There are twenty two wines available for sampling. Light snacks and appetizers will be served courtesy of Sobey’s. There is an online silent auction starting November 30th. Bidding ends at 7pm, Saturday, December 19th. There are some wonderful items for your consideration. Bookmark this auction page and come back from now till the event date to see additional items as they become available for bidding. More information or to register for the tasting: here..
previous years. The focus this year is value driven wines as very noticeable that only a handful of wines on this list is over $100 while the majority are less than $25. Besides value, availability and the ‘X’ factor are the other criteria. However, given that the top two wines of the year have been unavailable for some time now, it almost defeats the purpose of naming the Wine of the Year that no one can get any of. Nevertheless, every wine connoisseur watches with interest to see they can acquire any of the wines..deVine has sixteen wines that made the grade for your attention. deVine Wines is very excited to host a portfolio tasting and fundraiser on Thursday, December 10, 2009. Our store is partnering with Natasha Susylinski of Summit Fine Wines to showcase her portfolio and raise funds for the improvement of our beloved downtown street. The portfolio tasting will take place between 4:00 PM and 8:00 PM. Tickets are $20.00 each and can be purchased on-line or at the door. Over twenty wines and a selection of single malt scotch whiskey will be available for sampling. Light snacks will also be available. Four wine tasting stations will be set up to help guide you through Natasha’s portfolio. You can begin at the “No Skins” white wine station, meander to the “With Skins” medium-bodied and full-bodied red wine stations, and finally over to the “Dessert” port wine station. For a complete listing of wines available for sampling that evening, please visit the “Events and Tastings” link on our homepage. Last but not least, deVine Wines will be pleased to pour you a few drams at the single malt scotch whiskey station. All proceeds from the event will be turned over to the newly formed 104-Street Steering Committee. The committee is made up of 104-Street business owners, residents, representatives from the City of Edmonton, the Downtown Farmer’s Market, and the University of Alberta at Enterprise Square, the Downtown Business Association and both Ward 4 City Councilors. 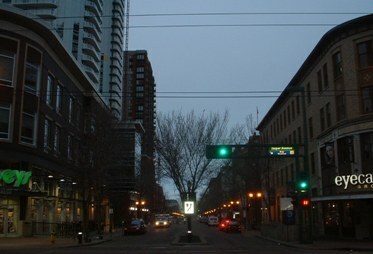 The committee’s goal is to promote the cleanliness, safety, security and marketability of 104-Street. The culmination of a three day Portuguese Festival, this drop in festival style tasting at deVines on Saturday, November 14th from noon to 5pm will feature over 40 different wines offering you a chance to sample a wide range of what Portugal has to offer, from bubbles, to rose, to whites to table reds and of course the famous Ports (various types) to finish. Portugal is currently the old world wine producing country offering the best quality for price ratio (i.e. best bang for the buck), and we will showcase this. There are two other events in this three day festival: On Thursday, the Naked Grape Series: Port, and on Friday the sold-out dinner tasting at Sabor Divino, our annual Roy Hersh Portuguese tasting. The $15 entry fee will benefit our charity of choice this year, the Alberta Council of Women’s Shelters. Christmas Arrives early at the Fairmont Jasper Park Lodge – A timeless classic, the 21st annual Christmas in November at the Fairmont Jasper Park Lodge has always signified the beginning of the holiday season for thousands of guests. From November 6th to November 19th – in a series of 4 packages featuring a wide variety of talented presenters ready to teach you all about cooking, decorating, mixology and fashion – everything you need to know to make this Christmas the very best. North America’s finest chefs, decorating personalities and spirit experts will assemble to share their secrets for creating a memorable holiday. The winners of the draw to attend Christmas in November has been announced, read on.. 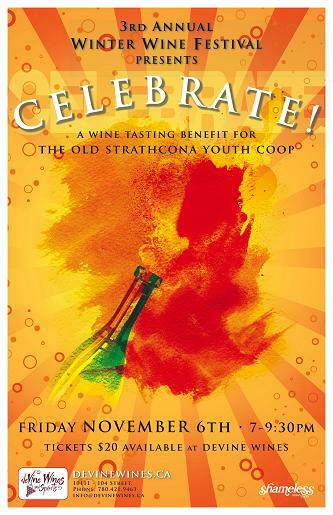 The 3rd Annual Winter Wine Festival presents ‘Celebrate’, a wine tasting benefit for “The Old Strathcona Youth Coop“. The event is scheduled for Friday, November 6th at deVine Wines & Spirits from 7-9:30pm. The Old Strathcona Youth Society is a valuable resource for marginalized and disadvantaged youth in the Old Strathcona area. This local charity relies heavily on volunteer staffing to deliver programs and funds raised will help in this regard. There will be a Silent Auction with many interesting wine items. Please mark your calendars and join us. Tickets available now at deVines for this festival style event.